Note: This is part of a series of Scanning Guides. Start HERE. Scan dpi: 800 for Epson brand scanners, 1200 for Canon brand scanners. 600dpi is acceptable only if you're unable to go higher without image issues, or what you're scanning is in great shape and undamaged. Source: Make sure your scanner is visible / selected. Next ensure the "Crop" tab is set to "Crop size: Auto". In the upper left app menu choose "File" > "Save Settings". In the bottom left of the app choose "Preview" to see your scan, at least for me usually this doesn't look like my final output, not sure if it's a Vuescan bug or what but don't worry if the preview looks off, go ahead and draw your cropping box around your image and select the Scan button. 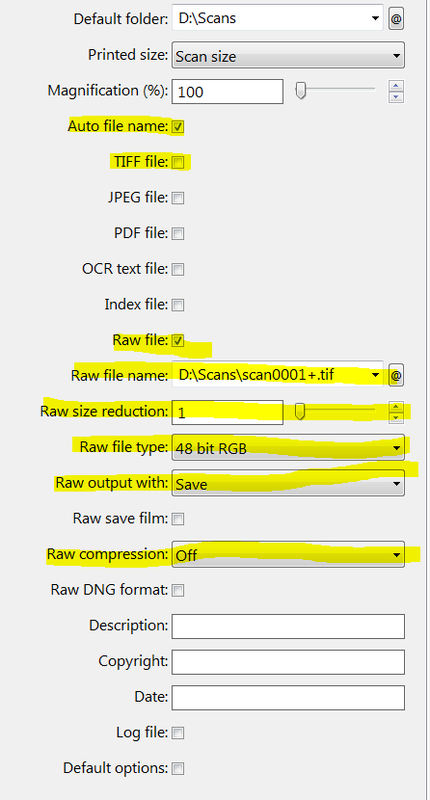 If your output looks like a dark RAW images you're likely good to go!